A century ago a group of men were tinkering away at a site in Lincoln on the way to changing the face of warfare. This year we will commemorate the first use of tanks in battle at Flers. If you drive down the old Roman road linking Albert and Bapaume you will find a fine memorial to the Tank Corps at Pozieres, ever so slightly spoilt by having a phone mast next to it. The heirs of those rhomboid monsters are a million miles away from what the chaps in Lincoln could have dreamt of, but although the future of the main battle tank is a little shaky in the face of smaller and cheaper designs, the place of the tank in our culture is beyond doubt. Tanks come in all shapes and sizes. You can have them as fridge magnets, models, crockery – you name it. Now, we even have one in a children’s story. It was inevitable. 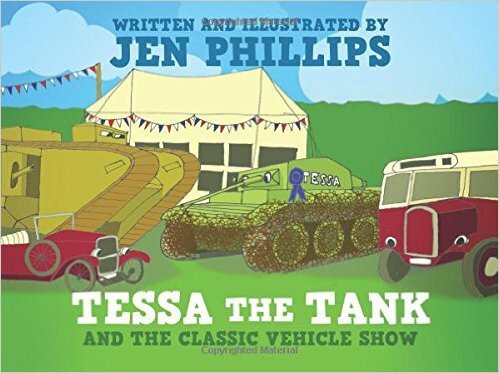 Tessa the Tank is a Tretrarch – not a hazy generic – and her story mentions Shermans and Churchills. Brian the tank transporter owes his good looks more to Oshkosh than Scammell or Thornycroft, but he knows what he is about and has strong opinions. Together our two heroes set off to a classic vehicle show and then the serious stuff begins. Never in a million years will I throw in a spoiler and tell you the plot. But rest easy comrades, there is a happy ending. This delightful little book is some way removed from the tea-sipping tigers, noisy chicken sisters and the other daisy headed characters I used to enjoy reading about with my children twenty years ago. It is a simple piece of kid’s story telling with colourful pictures and a plot that will do enough for your nippers or grandchildren who are curious about the military worlds you play in. It actually offers a validation for the things you love. When you read it to your kids you might even feel empowered. Perhaps Tessa is not far removed from Bob the Builder or even Thomas the Tank Engine. I am quite sure there are people who would be offended to find a tank in a child’s story and my response to that is predictable. Jen Phillips is having a lot of fun here and I am so pleased to have seen this book. My copy will soon be in the library of my nephews, Jack and Luke, and I know they will love it. The quaint Englishness to the story does translate; so don’t worry about the locations and details if you live far away from Fretwell Tank Museum. Just enjoy this lovely little book for what it is and imagine a bunch of four year olds knowing what a Tretrarch is. You have to smile at that. Don’t you! Perhaps my colleague Jack can coax Tessa to come down for Armour & Embarkation this summer. She’d love it.